Mastering decreasing stitches Knifty Knitter instructions can help you take your projects to the next level. Instead of being limited to simple hats and scarves, you can begin making socks, sweaters, or unique home décor items. What is the Knifty Knitter? 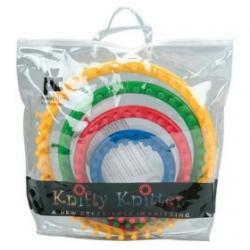 Knifty Knitter is a brand of knitting looms manufactured by Provo Craft. Also known as frame knitting, peg knitting, rake knitting, or Amish loom knitting, knitting with the Knifty Knitter is a fun and easy way to enjoy making handmade items without the stress of learning how to manipulate traditional knitting needles. For assistance completing your first Knifty Knitter project, check out the LoveToKnow Crafts slideshow tutorial on how to make a Knifty Knitter hat. The Ben Franklin Crafts site also has links to tutorials and videos that can help you get started with the Knifty Knitter. Basic Knifty Knitter projects like hats and scarves don't require increasing or decreasing stitches Knifty Knitter instruction. Unfortunately, most crafters will eventually tire of making these items and find themselves searching for ways to expand their project possibilities. When looking for decreasing stitches Knifty Knitter instruction, a crochet hook is helpful. Take the last stitch knitted, put it on the crochet hook and do a single crochet in this stitch. 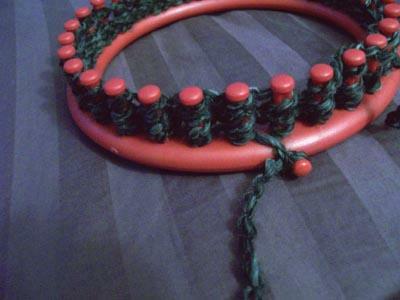 Take the next loops from the peg and single crochet through the two loops on the crochet hook. Continue in this manner until you have taken off as many loops as needed for your project. For best results, remember to keep this crochet stitch very loose. Learning how to increase stitches with the Knifty Knitter is quite simple. To increase a stitch, wrap the turning peg you have been using and use the next peg as the turn around peg. However, you should not knit the new peg until you have as many loops added to it as your regular knitted section. For example, if you are knitting with three loops on each peg, do not knit until you've wrapped three loops on the new turn around peg. If needed, you can add more than one stitch at a time. Pay attention to how tightly you are wrapping the yarn. If you wrap the yarn too tight, it will be hard to pull the stitches over. If you wrap it too loose, however, your project may not turn out like you had hoped. When using the Knifty Knitter long looms, consider investing in a pair of loom clips to make increasing and decreasing stitches much easier. For a project that has multiple parts, always use the same size loom for each knitted piece. Small variations in peg size between the different looms can cause errors and distorted spaces in the completed knitted project. You do not have to use all of the pegs when knitting with a Knifty Knitter loom. Skipping pegs can create a fun and unique look for your knitting. The book Loom Crafts with Knifty Knitter also contains a number of useful suggestions, as well as detailed photos that can help you improve your loom knitting skills.